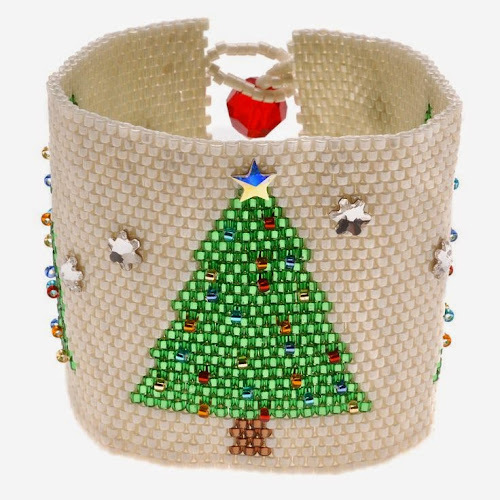 It’s been a great year for beaders and jewelry designers, with so many fantastic new goodies to enjoy, great tutorials and inspirations, and of course, no apocalypse to get in the way of creative time! Here are some of my favorite beading highlights of 2012. Several wonderful new beads arrived on the scene this year, including Swarovski Elements crystal pearl colors in red and pink coral, lapis, and turquoise. Swarovski Mini crystal beads fill in the gap between manmade beads and cut gemstones perfectly, providing their characteristic crystal shimmer in tiny shapes with a fantasy feel. Despite these innovations, Miyuki two-hole Tila beads stole the show again this year, with the arrival of several new colors and finishes. Tilas and Tila projects seem to be featured in nearly every beading publication of 2012. Soutache bead embroidery made a big splash in the technique department, with a gorgeous feature on the cover of Bead and Button magazine. 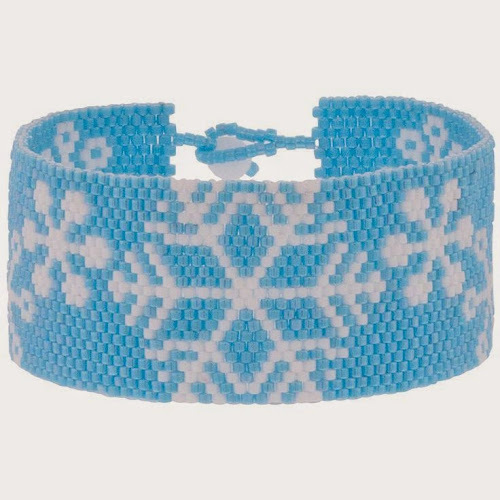 The inclusion of fiber braids into beadwork was a natural step for many beaders, especially those with a flair for embroidery techniques. 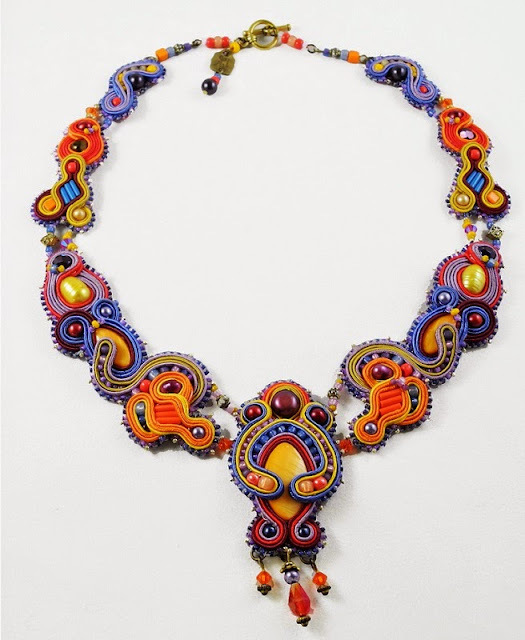 It was an absolute pleasure to chat with soutache artist Amee K. Sweet-McNamara about getting started with this emerging jewelry style. There were some fun tutorials featured on Inspirational Beading this year, including a few from guest instructors, such as How to Make a Resin Clay Ring. 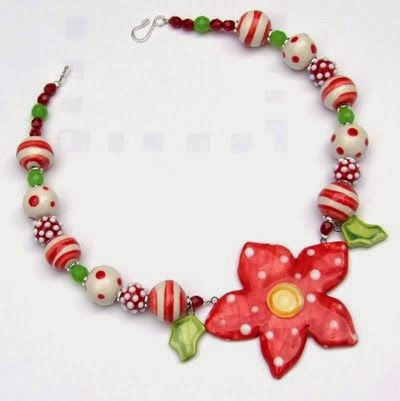 Some of my favorite tutorials of 2012 are: bead covered beads, Russian spiral, and Potawatomi daisy chain. 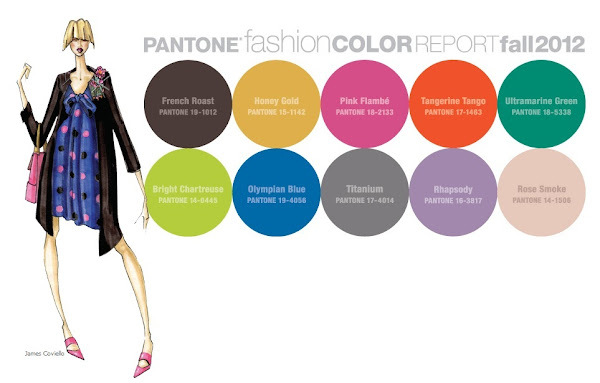 While 2012 had a fantastic lineup of color trends from Pantone, it is also the year that we learned of the upcoming jewel-tone color of the year. Looking forward to lots of emerald in 2013 doesn’t quite leave the 2012 palettes behind, which included a fantastic lime green, sodalite blue, and of course, Tangerine Tango. Last year, many beaders, crafters, and designers alike were eagerly anticipating new reality shows that would appeal to magpies everywhere. First came Project Accessory late last fall, which hoped to take off on the success of the creatively tantalizing show Project Runway. Then there was Craft Wars, which even included Margot Potter as a contestant! The show has received plenty of criticism from crafters and non-crafters alike, but it does provide an easy bar to stay above! Perhaps, hopefully, it will pave the way for even more beadwork exposure in mainstream media. Thank you so much for joining me for beading ideas and inspiration in 2012! What new waves do you plan to make with beading in the New Year? The end of the year is just around the corner, and before it passes us by, it’s time to wrap up another year’s beading challenge. For 2012, my mission was to use up all of the beads in my stash that I had been keeping for more than a year. It was a big goal, since my collection has been forming since around 2006 or so, and my preferences for style and stitches has changed a lot since then. There were a few flubs and failures in this destash challenge, but for the most part, I was able to turn beads I had been ignoring into really great designs. Apart from having lots of space for new beads, and being able to see the materials that I really like without distraction, the most rewarding part of the destash challenge has been all of the new experiences and insights into my own beading style and skill. It all began with an entry into the Ugly Necklace Contest, which turned out to be a very relaxing, liberating, and hilarious experience. This project wouldn't be revealed until the spring, so the first official destash design was a collar necklace. I nearly ended the challenge with another hideous design, but it turns out that there were a few inspirations left in the destash tray. A single roble wood bead became the base for a new necklace in my Egyptian Gods series. To create the look of Hathor’s crown and horns, I stitched a herringbone tube around wood beads in a pleasing curve. Although I've had a pretty good head start, this series is going to continue into next year's beading challenge. I'll be sharing the entire series to date, and all of the inspirations in 2013. Just when I thought I was done for the year, one last bit of inspiration struck. I had decided it was time to make use of some peanut seed beads I had ordered, and make a new spiral lariat. Predictably, I got bored after several inches of stitches - and anxious to start some other ideas cooking - so I switched to a pendant and added the last heart shaped nut bead from the destash pile. 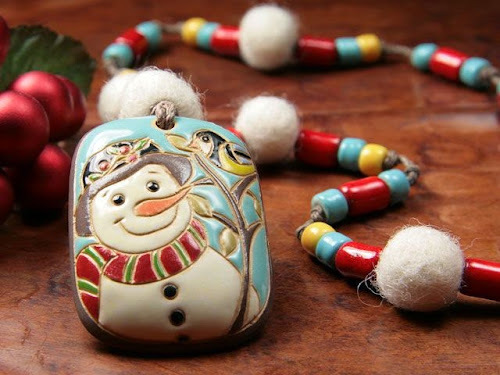 For accent beads, I still have a few mother of pearl charms with flowers painted on them. I’m probably going to add them to the craft beads and pretend that I never bought them. There are also two matte transparent ruby glass rings, one black clam shell Czech bead, and Swarovski Elements rivoli. The heart shaped nut bead found it’s home right after posing for this picture. I still have oodles of mother of pearl chips and macrame beads left, along with a strand of patterned wood beads. Since there are enough of them for just about any project, I don't mind setting them aside until the right idea comes along. Hopefully they won't keep me waiting too much. The rest of the bead tray spots are taken up by an assortment of seed beads. I’m not at all unhappy with the amount of beads I was able to use up this year, and I know I’ll be able to make use of what’s left. So they’re all going back into their proper place in the stash. Some of them may make an appearance in a new ugly necklace some time in the new year. Although I wasn't able to use up every single last bead that I had set aside for this challenge, I did achieve my goal of making new designs with old beads, and cleared out so many things that would still be sitting around if it weren't for the extras motivation. I'm calling it a success! Thank you so much for joining me on this year’s beading journey! December can be a pretty hectic time of year, when everything seems to happen at once, there’s never enough time to get it all done, and there’s always something that you forgot to add to your list. Personally, I feel like I’m being pulled in a dozen different directions at once this year. I’ve learned to let go of a lot of the expectations I pile on myself during the holidays, but I’ve still got gifts to make, shopping to do, and there are only a few weeks left to finish up the destash challenge - not to mention keep track of all the fantastic beading ideas that keep popping into my head at random. If you’re even a tiny bit stressed out during the holiday rush, you deserve a little break. So go put on a cup of tea or some cocoa, then put your feet up and feel the tension melt away as we pay a little tribute to an excellent blog for beaders. You’re probably already familiar with Beaded Laughter - a humor blog dedicated to pairing dreamy photos with sentiments only a beader would melt over. It’s been on hiatus for most of this year, but the laughs are still there to enjoy! Here are a few of my favorites. When we're rushing to finish projects for gifts, keep our shops up to date, and all the rest, it's easy to forget that our hobbies and our passions are meant to help us relax. I hope that all of my fellow beaders are able to find a little stress-free time with their beads this season! How are you coping with the holiday rush and crush? Now that December is rolling along at it’s usual speedy pace, I think it’s safe to take a look at some color palette ideas in traditional red, green, and white. 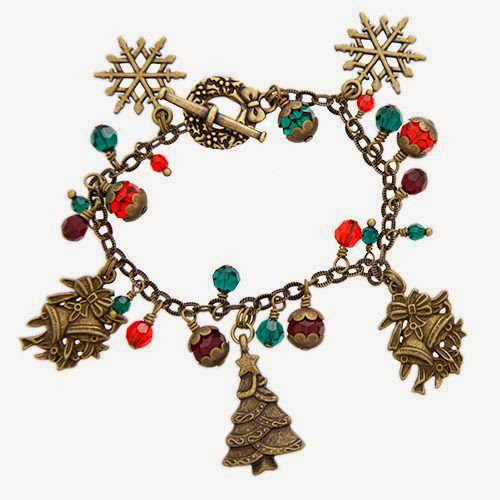 This trio represents many of our favorite holiday themes, like ribbon candy, snow, holly berries, and of course, decked out Christmas trees. To add a twist and a challenge, I decided to stretch the palettes out a little bit by using slightly non-traditional colors. Instead of holly red, pine green, and show white, I looked for assorted shades that would still have a festive vibe when used together. I started with the easiest approach first - opaques. 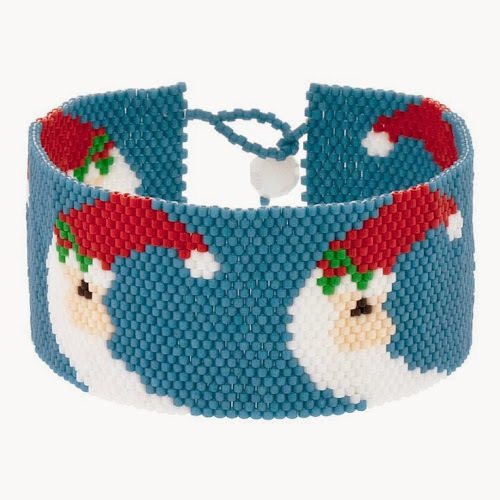 The pepper red seed beads are certainly Christmasy, but would they still be jolly with the addition of matte vanilla and cactus green? I was excited to discover that the palette was not only December-worthy, but delicious as well. I think Pepper Pistachio would look fantastic under the tree. Next, things got really wild when I replaced white with lovely Picasso ovals in a soft brown, and added some garnet coat ovals for red. I think almost any shade of dark green would look fantastic with this pair, but turquoise lined pale amber added an extra layer of woodsy flair. It’s got both the pine needles and the sap! Whenever I look at this trio, all I can think of is a Log Cabin, with bunches of holly around the edge, and firelight in the windows. For the final palette, I replaced Santa red with transparent raspberry. I couldn’t resist pairing it up with tasty lime green, which always reminds me of Jell-o. 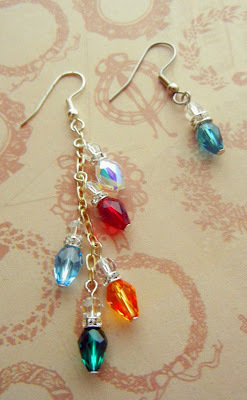 To steer these bright colors away from fruity, I added silver-lined crystal 6/o’s for a dash of sparkle. Now it’s a bowl of Christmas Punch! 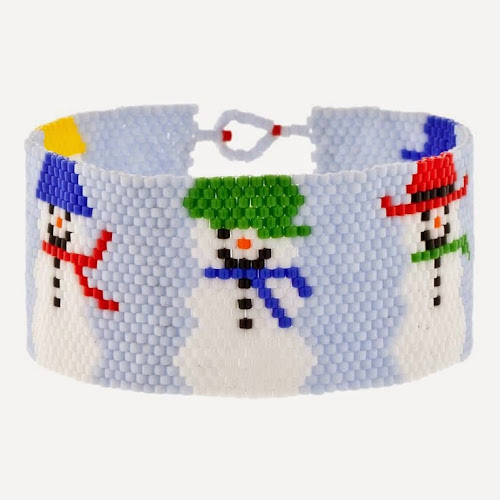 Do you have a trio of go-to colors for Christmas beadweaving? Before we get back to candy canes, beaded ornaments, and all things red and green, let's take a look at some of the other fantastic inspirations floating around this month. 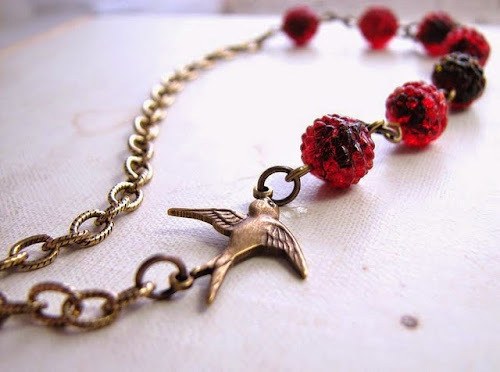 There are some gorgeous jewelry designs, beads, beautiful locales, and more beads - all discovered on Pinterest. 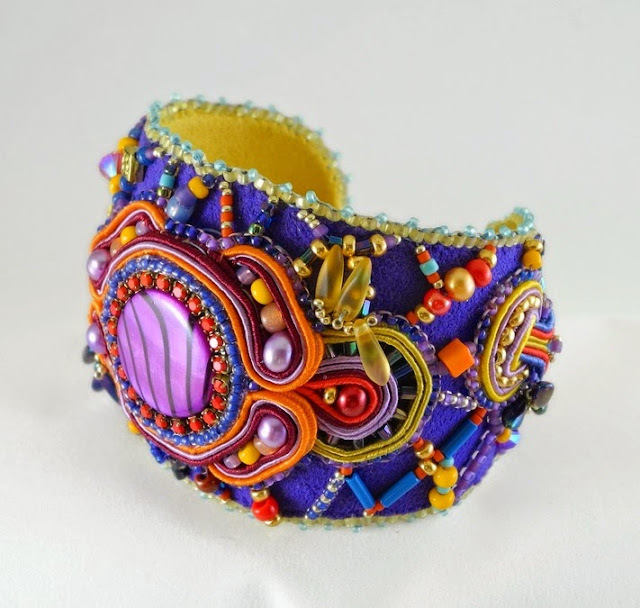 If you love to incorporate fabric, fibers, or ribbon into your jewelry designs, or just want to try something new and fabulous, soutache embroidery may be just the technique for you. You may already be familiar with the beautiful, curvy designs created with this unique material. Today’s guest, Amee K. Sweet-McNamara, was recently featured on the cover of Bead&Button magazine for her gorgeous aqua soutache necklace, along with a soutache earring tutorial for beginners. Inspirational Beading: What is your all time favorite jewelry technique? Amee: Soutache & Bead Embroidery is my absolute all-time favorite jewelry-making technique. I've always lusted after fabric and trims - when I was little, I hoarded scraps of ribbon and rick-rack from my mom's sewing projects. I didn't know what to do with them but just having them in a box, taking them out and sorting them, rolling them up, running my fingers over them gave me joy. Soutache is really just a type of braid so, I'm essentially making jewelry out of the textiles I've always loved. 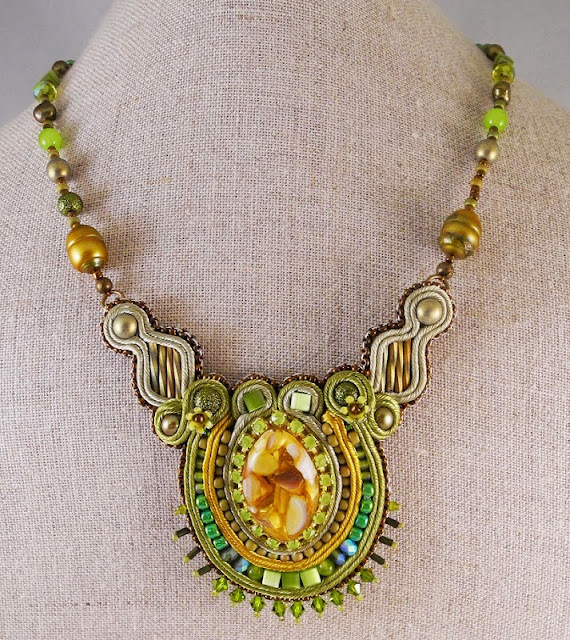 Inspirational Beading: How did you first learn about soutache? Amee: I was an obsessive bead embroidery fiend for years. Searching for new ideas and patterns on the Internet one day, I stumbled over this grainy little photograph of - what? - I wasn't sure... Didn't look like beads... didn't look exactly like embroidery either... everything written about the image was in another language (Polish? Russian? Who knows?!) 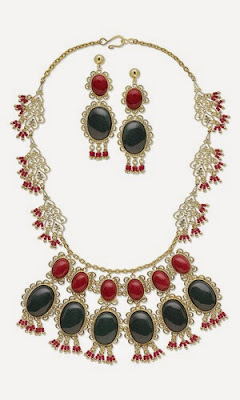 and the only word that was repeated more than once was the word "soutache." I had no idea what that was so, I started digging. When I finally figured out that it was Russia braid, off I went to Jo-Ann's Fabrics where I was delighted to discover that I could have any color of soutache I wanted as long as it was white, black or red. Undaunted, I purchased my yardage and went home to begin experimenting, trying to wrangle these long, tangly cords into something resembling the mysterious image I had seen. I tried and discarded a number of techniques including but not limited to gluing, pinning and gluing down onto a substrate and trying to whip-stitch everything from the back like it was a basket or a braided rug. It took a few months before I finally worked out the basics of the technique I use today. It's funny - I've been doing it this way for so long now but - in truth - the only other Soutache and Bead Embroidery Artists I've ever met are the ones I taught to do it... I'd love to meet another Soutache & Bead Embroidery Artist and see how they do it! Amee: I make a lot of work and - in general - I don't build pieces I don't like, but my absolute favorites are the ones with unexpected color combinations. Right now, I'm working on series of pieces called "Bollywood Wedding" and each time I make something new in this particular colorway I think, "Well, that's it... that's the best one ever... " and then I pick up the colors and something even juicier starts to take shape. Amee: Don't be stingy with your soutache! Of all of the things you will use in this craft - soutache, beads, Ultrasuede and, of course, your time - soutache is probably one of the least expensive! There is nothing more frustrating than spending hours stitching together a piece only to have it ruined because the very ends of your soutache braids are completely frayed. Always cut your lengths longer than you think you're going to need them. If you trim off a few inches and throw them away every time, you're doing it right. Amee: My mother's god-mother always used to say, "Just so you know... anything green is mine." There is something so wonderfully versatile about the color and its ability to shift from warm to cool. In particular, I am a sucker for Chartreuse. Give me any opportunity to slip a little of that into a project and I'm all over it. I'm also partial to Rust and Purple. Hmmm... I now feel compelled to go back into my studio and make something Chartreuse and Rust and Purple... I'll call it "My Interview Suit." 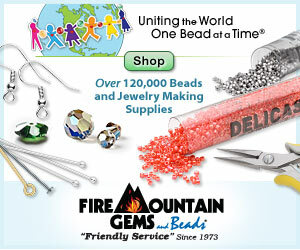 Inspirational Beading: What's your favorite type of bead or embellishment? Amee: In Soutache & Bead Embroidery, most of the beads are essentially "wrapped" by the soutache which means that very little light can pass through them. 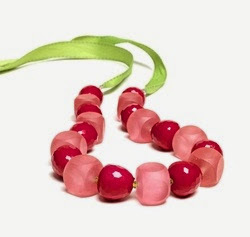 Consequently - while I love crystal and translucent beads of all kinds - I am constantly on the lookout for opaque beads or pieces that have enough sparkle, decoration or texture to hold their own in the work. 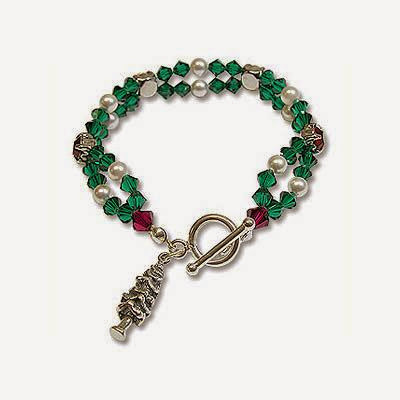 I particularly like the luminosity of freshwater pearls and mother-of-pearl beads. Amee: Oh, I would so recommend Soutache & Bead Embroidery primarily because - unlike many other crafts - Soutache & Bead Embroidery is in its infancy. New techniques are being developed every day and the possibilities are limitless. I regularly wake up in the middle of the night with new ideas and I simply cannot create them as fast as I can imagine them. Beautiful creations are being posted constantly so, there is an enormous space in which artists can make their own mark on the craft. Inspirational Beading: In your opinion, what is the best way for beginners to learn this technique? Amee: Everyone learns differently but one of the most important things to get across in Soutache & Bead Embroidery is the understanding of thread tension. A book with really good step-by-step photography can go a long way toward getting this across but there's nothing like getting to see the actual movement. A class is always great because a good teacher can accommodate a number of different learning styles and demonstrate the movements several times. A video, on the other hand, is less expensive, more accessible and has the benefit of being able to be played over and over again. In my humble opinion, my 40 minute video Soutache & Bead Embroidery - Lesson #1 - Basic Harp Earrings is the best video for the English-speaking market. You can see more of Amee’s incredible soutache designs, and learn about the techniques she uses on her website - Amee Runs with Scissors. She also offers tutorials, kits, and soutache embroidery supplies, plus resources for finding materials and learning more about soutache jewelry. 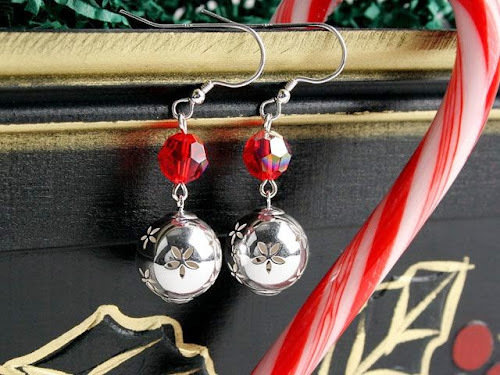 What’s your favorite holiday theme to use in jewelry?